“ARC organized a wonderful event. The weather was perfect. We all had a great race with fantastic results. TriHarder was covered in the Toronto Star - twice. Team Running Free and Explore were concerned. Ian Adamson and Nathan Fa'ave (two of the best racers in the world) have heard of TriHarder and I sensed a little fear in their voice when I met them after the race! The raced started on a good note - we saw Angela at the start. For the next two minutes of my life I could only see the ground in front of me as Daniel and I carried a canoe in tandem down a trail and over a bridge. 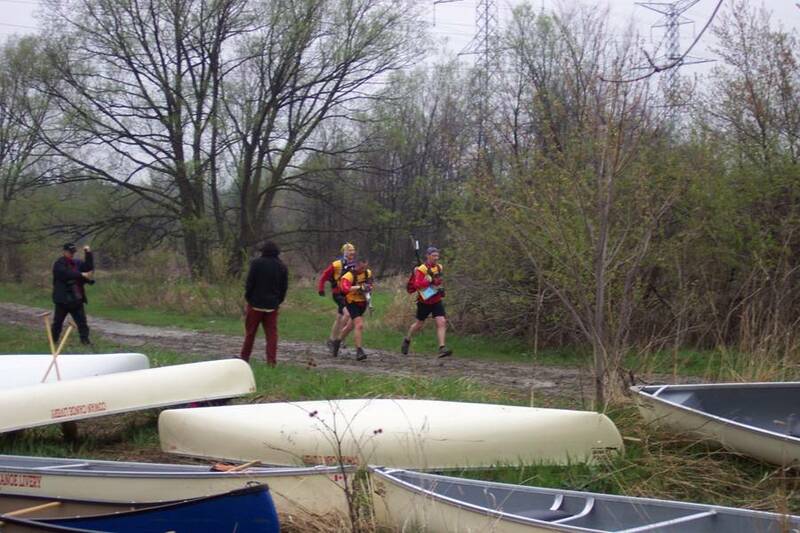 We dropped the canoe and made a mad dash across the Humber River, not once but four times! We emerged from the orienteering section and ran to the canoes. The race Directors, Reporters and Fans had the dumbest look on their face (a mix of shock and disbelief). They then proclaimed that we were in first place - now the look on Woody, Daniel and my face surpassed everyone's. We boarded our canoe and raced down the river. Normally I have the option of asking the fans which way the other racers went - this time we had the opportunity to paddle the wrong way, right in front of the Toronto Star Reporters! Fortunately I guessed right. Team Running Free and Explore were right on our heels. They were very upset that we were in the lead. Having an Olympic Canoe Athlete on the team helped - both teams had caught up to us as we transitioned out of the canoes. We managed to stay together as a pack of three teams for a few checkpoints but by the time we transitioned to our bikes they had a good 15 minute lead on us. As Woody explained to the reporters "We're not slow, they’re just fast." Finding the trail to take us to the asphalt trail, for us, was the most confusing part of the race. The trail map was not to scale, the trails were color coded except most of the colors looked very similar and we were overwhelmed with fan support, phone calls and reporters asking us questions. Being the photogenic, cordial, and lucky (because we have so many supporters) people that we are, we took the phone call, answered the reporter's questions, posed for a few photos and thanked our supporters before going in a random direction and eventually making it to the correct trail. The trail ride and navigating was straight forward. We ended up at an inlet to a storm sewer which we entered. The Toronto Star published a great shot of Daniel carrying his bike into the 1.5 km long, dark sewer. We beat the reporters to the other side (they drove - we ran), answered a couple quick questioned, tried to figure out where we were and we were off for the looong ride back. This time the ride seemed a little uphill, and into a strong headwind. Woody and Daniel are very strong riders and kept me motivated by the fear that no one would find my dead body if I let them down (after all, they know of an open sewer grate). 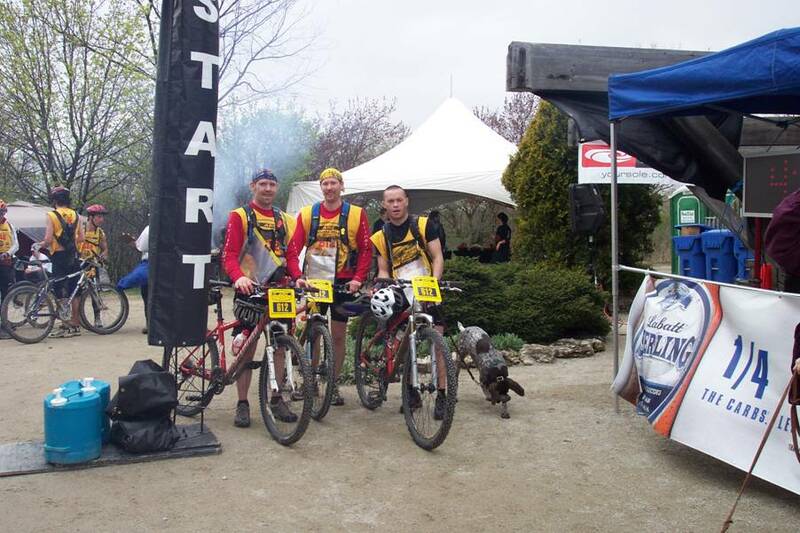 We crossed the finish line in third place overall and second in the open male category. We were about 35 minutes behind the race leaders. We quickly got changed and were nearly run over by TriHarder: Try Even Harder (Mark, George and Irene) as their strong legs propelled them to the finish line at speeds that may never be seen again! They finished a strong 9th overall and about 6th in the Co-Ed category. Minutes later TriHarder Pierre (Pierre, Steve and Tania) crossed the finish line with another strong finish. It was simply a matter of time for one of our teams to be on the podium again. We always seem to make the one mistake, have one person injured, or have an issue with our equipment. This time for TriHarder DieHarder, it all fell into place. We had a flawless race (one small navigation error that may have cost us 2-3 minutes). We were moving the entire race but knew when to stop and think things through. Thank you to all of the supporters. I don't think you fully understand how motivating it is to see you throughout the race. Altogether it was a great experience. Woody and Daniel are so strong. The chemistry worked really well for us. We were proud to see Irene, George and Mark right behind us and Pierre, Steve and Tania right behind them. At the start of the race I was pretty sure one our teams would have great finish. I was wrong. All three teams did. Good work TriHarders!